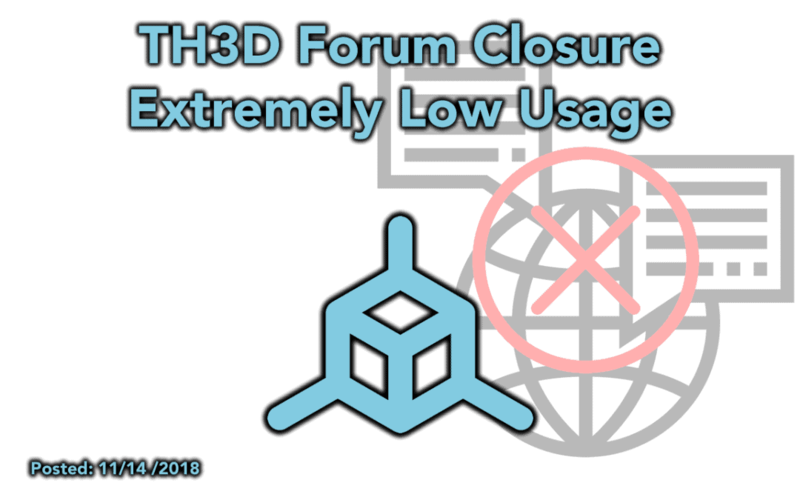 We regret to say that we are shutting down the TH3D Forums due to extremely low usage. We hoped that people would use the forums and want them but our Discord and Facebook groups are very active now. Why shut it down though? The issue is that the few people that used the forums were not getting many answers and this is just going to frustrate people that use them instead of helping them. We want to make sure everyone is getting the help they need so shutting it down was the best course of action. The Forum.TH3DStudio.com URL will redirect to our Discord server from here on out so that people clicking those links that are in the wild will be directed to somewhere they can get help. All data from the forum will be deleted from our servers.